دباغ, رحیم, خوش سیرت, مازیار, بزرگی‌امیری, علی. (1397). ارائه مدل خرید اقلام امدادی تحت مناقصه معکوس چند شاخصه با بکارگیری رویکرد ترکیبی برنامه‌ریزی ریاضی چندهدفه. پژوهشنامه بازرگانی, 22(86), 189-218. رحیم دباغ; مازیار خوش سیرت; علی بزرگی‌امیری. "ارائه مدل خرید اقلام امدادی تحت مناقصه معکوس چند شاخصه با بکارگیری رویکرد ترکیبی برنامه‌ریزی ریاضی چندهدفه". پژوهشنامه بازرگانی, 22, 86, 1397, 189-218. دباغ, رحیم, خوش سیرت, مازیار, بزرگی‌امیری, علی. (1397). 'ارائه مدل خرید اقلام امدادی تحت مناقصه معکوس چند شاخصه با بکارگیری رویکرد ترکیبی برنامه‌ریزی ریاضی چندهدفه', پژوهشنامه بازرگانی, 22(86), pp. 189-218. دباغ, رحیم, خوش سیرت, مازیار, بزرگی‌امیری, علی. ارائه مدل خرید اقلام امدادی تحت مناقصه معکوس چند شاخصه با بکارگیری رویکرد ترکیبی برنامه‌ریزی ریاضی چندهدفه. پژوهشنامه بازرگانی, 1397; 22(86): 189-218. 2دانشجوی کارشناسی ارشد مهندسی صنایع، دانشکده مهندسی صنایع، دانشگاه صنعتی ارومیه، ارومیه، ایران. 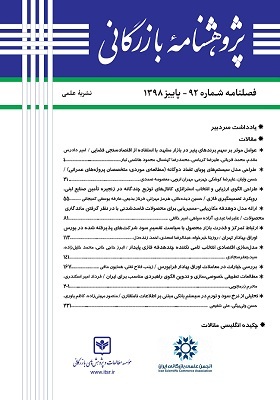 3استادیار، گروه مهندسی صنایع، دانشکده مهندسی صنایع، دانشگاه تهران، تهران، ایران. تأمین اقلام امدادی مورد نیاز در شرایط پس از بحران به دلیل عدم قطعیت تقاضا و شدت وقوع فاجعه، مسأله‌ای زمان-بر و پیچیده است. در این مقاله، با هدف تسهیل عملیات خرید و هماهنگی میان تأمین‌کنندگان و سازمان‌های امدادی، مدلی مبتنی بر مناقصه ارائه شده است. ساختار مناقصه پیشنهادی شامل دو فاز ساخت و ارزیابی است که بترتیب توسط تأمین‌کنندگان (فروشندگان) و سازمان امدادی (خریدار) مورد بررسی قرار گرفته است. در فاز ساخت مناقصه، یک مدل برنامه‌ریزی ریاضی غیرخطی فازی چند هدفه ارائه شده که ریسک اختلال در مراکز تأمین و توزیع و همچنین عدم قطعیت در پارامترها را در نظر می‌گیرد. مدل پیشنهادی با استفاده از روش محدودیت اپسیلون تقویت شده حل و بسته‌های پیشنهادی بهینه تأمین‌کنندگان شامل حجم، قیمت و زمان تحویل اقلام امدادی تعیین شده است. در فاز ارزیابی مناقصه، برای رتبه‌بندی تأمین‌کنندگان از روش پرومتی فازی استفاده شده است. در این مرحله از مناقصه، هر یک از تأمین‌کنندگان با توجه به بسته‌های پیشنهادی و سایر معیارهای کیفی، توسط خریدار ارزیابی شده و برنده مناقصه مشخص می‌شود. در نهایت، به جهت اعتبارسنجی مدل و کاربرد‌پذیری آن مثال عددی ارائه و از جنبه‌های مختلف تحلیل شده است. 2M.Sc. graduated, School of Industrial Engineering, Urmia University of Technology, Urmia, Iran. 3Assisstant prof., School of Industrial Engineering,College of Engieering, University of Tehran, Tehran, Iran. Bagchi, A.; Paul, J. A. and Maloni, M. (2011); “Improving Bid Efficiency for Humanitarian Food Aid Procurement”, International Journal of Production Economics, Vol. 134, No. 1, pp. 238-245. Balcik, B.; Beamon, B.M. ; Krejci, C.C. ; Muramatsu, K.M. and M. Ramirez (2010); “Coordination in Humanitarian Relief Chains: Practices, Challenges and Opportunities”, International Journal of Production Economics, Vol. 126, No. 1, pp. 22-34. Bichler, M. (2000); “Experimental Analysis of Multi-attribute Auctions”, Decision Support Systems, Vol. 29, No. 3, pp. 249–268. Boran, F.E. ; Genç, S.; Kurt, M. and D. Akay (2009); “A Multi-criteria Intuitionistic Fuzzy Group Decision Making for Supplier Selection with TOPSIS Method”, Expert Systems with Applications, Vol. 36, No. 8, pp. 11363-11368. Chang, B.; Chang, C.W. and C.H. Wu (2011); “Fuzzy DEMATEL Method for Developing Supplier Selection Criteria”, Expert Systems with Applications, Vol. 38, No. 3, pp. 1850-1858. Chen, C.T. ; Lin, C.T. and S.F. Huang (2006); “A Fuzzy Approach for Supplier Evaluation and Selection in Supply Chain Management”, International Journal of Production Economics, Vol. 102, No. 2, pp. 289-301. Chen, A.; Hsieh, C.Y. and H.M. Wee (2016); “A Resilient Global Supplier Selection Strategy—A Case Study of an Automotive Company”, The International Journal of Advanced Manufacturing Technology, Vol. 87, No. (5-8), pp. 1475-1490. Chen-Ritzo, C.; Harrison, T. P.; Kwasnica, A.M. and D.J. Thomas (2005); “Better, Faster, Cheaper: An Experimental Analysis of Multi-attribute Reverse Auction Mechanism with Restricted Information Feedback”, Management Science, Vol. 51, No. 12, pp. 1753–1762. Cheng, C.B. (2008); “Solving a Sealed-bid Reverse Auction Problem by Multiple-Criterion Decision-Making Methods”, Computers and Mathematics with Applications, Vol. 56, No. 12, pp. 3261-3274. David, E.; Azoulay-Schwartz, R. and Kraus, S. (2006); “Bidding in Sealed-bid and English Multi-attribute Auctions”, Decision Support Systems, Vol. 42, No. 2, pp. 527–556. Dhanalakshmi, S.; Kannan, S.; Mahadevan, K. and S. Baskar (2011); “Application of Modified NSGA-II algorithm to Combined Economic and Emission Dispatch Problem”, International Journal of Electrical Power & Energy Systems, Vol. 33, No. 4, pp. 992-1002. Elevli, B. (2014); “Logistics Freight Center Locations Decision by Using Fuzzy-PROMETHEE”, Transport, Vol. 29, No. 4, pp. 412-418. Ertem, M.A. ; Buyurgan, N. and M.D. Rossetti (2010); “Multiple-buyer Procurement Auctions Framework for Humanitarian Supply Chain Management”, International Journal of Physical Distribution & Logistics Management, Vol. 40, No. 3, pp. 202-227. Ertem, M.A. and N. Buyurgan (2011); “An Auction-based Framework for Resource Allocation in Disaster Relief”, Journal of Humanitarian Logistics and Supply Chain Management, Vol. 1, No. 2, pp. 170-188. Ertem, M.A., Buyurgan, N. and E. A. Pohl (2012); “Using Announcement Options in the Bid Construction Phase for Disaster Relief Procurement”, Socio-Economic Planning Sciences, Vol. 46, No. 4, pp. 306-314. Ertem, M.A. and N. Buyurgan (2013); “A Procurement Auctions-based Framework for Coordinating Platforms in Humanitarian Logistics”, In Humanitarian and Relief Logistics, Springer New York, pp. 111-127. Falasca, M. and C.W. Zobel (2011); “A Two-stage Procurement Model for Humanitarian Relief Supply Chains”, Journal of Humanitarian Logistics and Supply Chain Management, Vol. 1, No. 2, pp. 151-169. Glover, F. (1975); “Improved Linear Integer Programming Formulations of Nonlinear Integer Problems”, Management Science, Vol. 22, No. 4, pp. 455-460. Huang, M.; Qian, X.; Fang, S. C. and X. Wang (2016); “Winner Determination for Risk Aversion Buyers in Multi-attribute Reverse Auction”, Omega, 59, pp. 184-200. Jiménez, M.; Arenas, M.; Bilbao, A. and M.V. Rodrı (2007); “Linear Programming with Fuzzy Parameters: An Interactive Method Resolution”, European Journal of Operational Research, Vol.177, No. 3, 1599-1609. Mavrotas, G. (2009); “Effective Implementation of the Ε-constraint Method in Multi-objective Mathematical Programming Problems”, Applied Mathematics and Computation, Vol. 213, No. 2, pp. 455-465. Mukherjee, K. (2016); “Supplier Selection Criteria and Methods: Past, Present and Future”, International Journal Of Operational Research, Vol. 27, No. (1-2), pp. 356-373. Petric, A. and G. Jezic (2010); “Multi-attribute Auction Model for Agent-based Content Trading in Telecom Markets”, Knowledge-Based and Intelligent Information and Engineering Systems, pp. 261-270. Qian, X.; Huang, M.; Gao, T. and X. Wang (2014); “An Improved ant Colony Algorithm for Winner Determination in Multi-attribute Combinatorial Reverse Auction”, In Evolutionary Computation (CEC), 2014 IEEE Congress on. IEEE. pp. 1917-1921. Schulz, S. F. (2009); “Disaster Relief Logistics: Benefits of and Impediments to Cooperation between Humanitarian Organizations”, Haupt Verlag AG, vol. 15. Shokr, I. and S. A. Torabi (2017); “An Enhanced Reverse Auction Framework for Relief Procurement Management”, International Journal of Disaster Risk Reduction. Trestrail, J.; Paul, J. and M. Maloni (2009); “Improving Bid Pricing for Humanitarian Logistics”, International Journal of Physical Distribution & Logistics Management, Vol. 39, No. 5, pp. 428-441. Vidal, C. J. and M. Goetschalckx (2001); “A Global Supply Chain Model with Transfer Pricing and Transportation Cost Allocation”, European Journal of Operational Research, Vol. 129, No. 1, pp. 134-158. Zhang, W. and Reimann, M. (2014); “A Simple Augmented E-constraint Method for Multi-objective Mathematical Integer Programming Problems”, European Journal of Operational Research, Vol. 234, No. 1, pp. 15-24.